Best Tent Heaters For Indoor Use Review: Top On The Market in 2019! When you spend the night in a camp somewhere in the woods and it’s something like -20F outside – tent heater is probably the first thing you would think about. Well, it makes sense that you actually have to think about the heater long before the trip, when you are only planning it, for example. And if you’ve already heard anything about heaters, you probably know one important thing. Of course, choose the heater wisely because if your tent is very small or low-quality, you can burn it by accident and get hurt, or even worse. That’s why you also have to pick a good canvas tent. And this “thing” is: choosing a tent heater is not the easiest task. Let’s be honest, the amount of information that should be captured and digested, the complexity of analysis that should be done – well, it’s difficult and very time-consuming. However, it’s not a rocket science, of course. I’ve spent a few days to sort the facts out and to get to the bottom of this subject – it’s not very long, but if you don’t have two days, I’m happy to help. I’ve tried to make it as clear as possible and as simple as it can be. Here you will find only the most important advantages and disadvantages of these five tent heaters that I’ve chosen. Why 5? I’ve thought about 3 or 10 but then decided to choose the middle way. All these tents are good in certain circumstances, each one has its own pros and cons, and I’ll tell you about all of them in details. What is the basic information you must know about heaters before choosing the best tent heater? That’s quite simple. Propane heaters use propane as fuel and electrical heaters need an electrical supply. Oh, and the third type of the heaters is chemical, but as I’ve just said, you don’t need such devices – because such heaters can only heat your sleeping bag, not the whole tent. Which one to choose? There is no clear answer because no type is 100% better than the other type. Usually smaller and thus more comfortable during travels. For the majority of heaters, a standard 16 oz. cylinder of propane would be enough for 7 hours of work. Don’t need electrical power, of course. Quite safe, too. Usually, such heaters have turned off automatic mechanisms, too – and if the oxygen level is too low, for example, the heater will turn off (or will refuse to turn on). I’ll tell you more about this mechanism a little bit later because it’s very important. A tent must be ventilated. Of course, if you need a heater, it’s cold outside, which means that you will have to let the cold inside. If you don’t do it, the heater will turn off because of the low oxygen level (and you will feel bad because of this, too). You’ll have to be careful with the materials around the propane tent heater because such heaters are very hot. And these two disadvantages lead to the third one: you can’t sleep when such heater is operating. Safety (electric tent heater is the safest heater, actually). Overheating is almost impossible (and that’s why you can place such heaters on any material, which is very important if the place is limited, like inside of a tent). Usually have automatic shut off mechanisms (another point for safety). Need electrical power to work. It’s the biggest disadvantage, I guess. Make air dry so it’s not very comfortable to breathe inside the tent. Can heat smaller areas than propane heaters. The sound! The construction of electrical heaters leads to the constant turning on and off the fan – and this sound can annoy you. Radiant heaters are great for small areas like tents. Convection heaters are perfect for large tents and larger spaces in general. So, now when you know something about the subject, let’s talk about the main question: which heater is the best heater for tent camping? As I’ve said, I’ve collected five heaters here – all of them are good so it’s up to you to choose. I’ll try to make this choice very simple for you. Let’s go! This is a propane heater from a known manufacturer (Mr. Heaters). It’s not very small and portable (9x14x14 inches), but this isn’t a disadvantage. Its weight is 9.5 pounds. Safety: It’s a safe heater (but it’s still a propane heater with all the problems of such heaters). Auto shut off will shut the heater off if anything is wrong (like if the oxygen level is very low or if the pilot light is outside the heater. I’ll give it 4 points. General impression: Mr. Heater Buddy is great. Large heating surface, four-position control – it does really work as a heater must work. 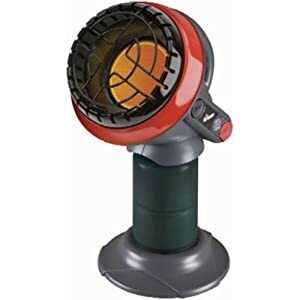 Moreover, this heater works with no sounds at all, it doesn’t smell, it can be used outdoor even. One small canister or propane would be enough for about 4-6 hours of work (if it’s low heat, of course), and it’s really perfect for small places. The instant hit, what else do the majority of clients need? It’s durable, warm, safe and very good propane heater from the popular manufacturer. I’d say that it’s probably the best heater for tent camping, but let’s continue the review. I can give 5 points because it’s very, very close to a perfect heater. Possible problems: Well, this Buddy is one of the most popular propane heaters in the world, so it makes sense that there are MUCH more positive reviews than the negative ones. But I’ve done my best and analyzed all the problems of this heater. The first problem is: it’s not so easy to use a large propane tank with it. You’ll need to buy an extension hose and filter kit before, so bear this in mind. The second problem is leaks. They are not very often, but if you don’t check the heater for leaks, the whole heater can get caught on fire, so please, be very careful! And the last problem is… Well, it’s not actually the problem, but this heater will not light if you are something about 7,000 feet or higher. That’s because of the safety – Mr. Heater Buddy doesn’t work if the oxygen level is low, and that’s exactly what’s happening at the attitudes like these. So it’s not a bug, it’s a feature. I give 4 because the amount of possible problems is not very big. Let’s be honest: it’s a very good heater, and probably one of the best ones here. It’s a heater, produced by the same company as the previous one. It wasn’t difficult to understand this fact because of its name, right? The previous heater was called “Buddy”, and this one is “Little Buddy” – which means I’m going to describe the little version of the first heater. But is it just smaller or worse? Let’s see. Safety: It’s a heater will all modern safety sensors and auto-shutoff mechanism. When the oxygen level is low, it will turn off – the same is for some other unexpected problems. Tip-over safety systems are here, too, of course. Actually, all the modern propane heaters cope well with safety – the majority of them have all these systems and mechanisms that make the heat safe. But, in my opinion, this heater is not very safe and I can give only 3 points – I’ll explain, why, in the next paragraph. 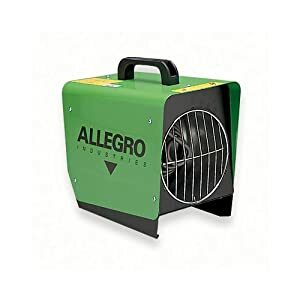 General impression: This heater is quite small and really portable – It has the same heat settings as the previous heater – 4,000 and 9,000 BTU/hr, which means it will work well both for small tents and for bigger places. According to the description by the manufacturer, Mr. Heater Little Buddy can be used in the rooms up to 95 square feet – but according to the users’ feedbacks and reviews, well, it’s not as good. When it comes to the practice – this Little Buddy can be a disappointment. The buyers of this heater say that sometimes when the unit works, the fire is outside the heater – and of course, in such cases, it becomes impossible to use it. That’s why I gave it only 3 points in the previous paragraph (safety), and that’s why I can give only 3 points for the general impression. It’s not the only problem of this heater – sometimes the instructions are awful, the customer support service will most likely not help you to refund or to replace the heater if there are any problems with it. However, these problems are not very rare. 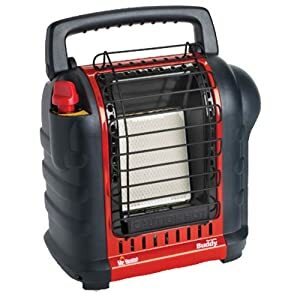 This heater has certain advantages – it’s really small and portable, it works well in the majority of cases and it doesn’t need too much propane to work. So it’s only you who chooses. Possible problems: I’ve already told you about them: bad instructions, the customer support that will not help you to refund/replace the item, the absence of screws inside (like, 4 instead of 6). Moreover, the heater needs to be cleaned with a small pipe cleaner or with an air compressor frequently, and sometimes the flame goes outside. Sounds very bad, but, as I’ve said, the problems are not very common. However, you still have to be ready for them. 3 points here, too. 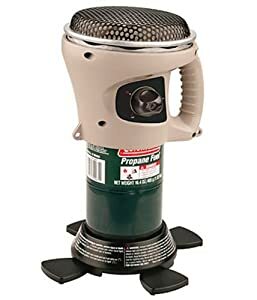 It’s another portable propane heater, which would be a good choice if you need something small and effective. But it’s not the best choice if you need a hot vent tent heater, that’s what I can tell you. Well, let’s see. Safety: I’m confused with this point. On one hand, it’s really NOT as safe heater as the other heaters on this list. On the other hand – I can say that it’s not safe only if you will use it in tents, but it’s not very good in this role. That’s why this Coleman Heater is a very… strange thing. Here’s what I’m talking about. It doesn’t have an auto shut-off, so if the oxygen level is very low in the room/tent, this heater will not shut off automatically. It’s a very basic feature actually and almost all the modern heaters have it – but Coleman Catalytic heater doesn’t. Is it bad? Yes. But on the other hand, this heater isn’t designed for tents and rooms. It’s a very good choice during the golf game, for example – like if you need to use it in your golf cart. In such cases, you shouldn’t worry about ventilation, and that’s exactly when you can use Coleman heater. If you use it in a tent, buy a carbon monoxide detector first, that’s what I think. 2 points. General impression: 3 points. It’s not bad – but only in certain situations. If you are planning to use it inside a tent, it’s not the best decision, but for golf carts and outside sports, well, it’s good. It’s really portable and small, it weighs 2.5 pounds and it can work 12-14 hours from one standard 16.4 cylinder of propane. Sounds cool, but the problem is: its output is 1,500 BTU (almost five times less than the previous heater! ), which means it just can’t produce heat enough for a large room. Another thing that impressed me: there is no ignition button on this heater! You just can’t turn it on without a lighter or matches. I think that it’s a problem. And the last thing that influenced the general impression: this heater only heats above it – so if you lay on the ground in a tent, for example, the top of the tent will be the only warm thing inside. Possible problems: Well, it seems like I’ve already described all of them. It just doesn’t produce much heat, so make sure 1,500 BTU would be enough for your purposes before buying it. Moreover, I can’t recommend buying it if you don’t have a carbon monoxide detector – in such case you may have a headache because of a low oxygen level (but not only headache, of course). And don’t forget your lighter or matches, of course, because there is no button that would turn this heater on. Oh, and don’t ever let it work when you are sleeping, because, according to some reviews, the sparks can jump out! I give it 3 again. Well, this heater is just good – I can’t say much about it so the review will be quite short. Safety: 5. Due to the fact it’s an electric heater, it’s very safe – there is no open fire, it doesn’t heat the materials around it, overheating is impossible (if it isn’t broken, of course) and no sparkles can jump out. It doesn’t influence the oxygen level and doesn’t produce carbon monoxide, and the automatic shut-off systems are here, too. That’s why you don’t need to worry about the safety of this heater. General impression: 4. It’s powerful and safe, it can heat the whole tent (even if the tent is large, because the heating power is 5,000 BTU), but it’s quite big and it weighs 14 pounds (6.3 kg). I can’t say that it’s a portable tent heater, and that’s why I give 4 points to it, not 5. Possible problems: 5. I can’t say that there are any common problems with this heater. But remember that you will need an electric power supply to make it work. And that this heater can make the air dry, of course. Good heater, that’s what I can say. It’s almost as good as the first one, Buddy by Mr. Heater – the main difference is that one of them is a propane heater and the other is an electrical one. And Buddy is cheaper, of course. This heater is cheaper than the previous one, but it’s three times more expensive than the first two heaters from Mr. Heater company. Is it worth it? Let’s talk about it. 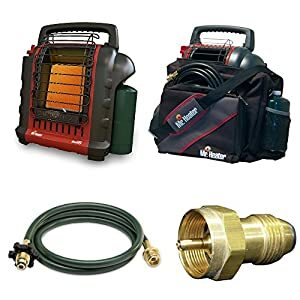 One more thing: it’s not just a heater, it’s the whole pack – heater, carry bad, 10 foot hose assembly, and refill adapter. That’s an all-in-one heater – you just buy it and start using it, without any additional actions. Safety: 4. It’s as safe as a propane heater can be, with all those auto-shut-off systems. If you tip the heater over, it will shut off. The same is if the oxygen level is too low, or if the light goes outside the heater. General impression: 5. It’s very close to a perfect propane heater, just like the Buddy heater (the 1st on the list). But I’ve given 5 instead of 4 to this heater because the bundle includes all the things needed – like the adapter and carry bag. The only thing you’ll need to buy is a propane tank (and propane, of course), all the other accessories are here. Some of them (like a refill adapter) are quite hard to find on the Internet, so this purchase will make the life easier for you. Save money, save time – it’s easy as that. And, of course, it’s very good as a heater, too – 9,000 BTU is enough to heat a very large tent or room. Possible problems: 4 points. There are no negative feedbacks about this heater, but I recommend you to be careful with the pilot light and, what’s more important, to clean the heater regularly. Your choice will depend on your needs. If you need a small and portable heater, Little Buddy would be great. Need something for a golf-cart? Buddy and Little Buddy aren’t good for this purpose, but Coleman Catalytic Heater will definitely help. Want to buy an electric heater? An item from Allegro Industries would be a great and very safe choice. If you are looking for a pack with all the accessories and adapters needed, the last item, MH9BX Buddy Heater is exactly what you need. And the first one, Mr. Heater’s Buddy, is just a very, very decent propane heater for those who are simply looking for good heaters. The main idea is: you have to understand what you need before buying a heater. I’ve tried to choose 5 heaters that will be useful for all the most important purposes. Which one would you choose?